Jungle Family. It's finally finished. Credit starting on the left: Mine-Nidia, behind Tarzan hHutchy-Kia, auroraxaurella-Kimama, TheCrystalRing-Tamela, Angeelous-Chinete, LightningRed-Iraya, and the boy अगला to Pocahontas is chesire- Mawali.. HD Wallpaper and background images in the डिज़्नी क्रॉसोवर club tagged: disney crossover oc tarzan pocahontas. It's finally finished. 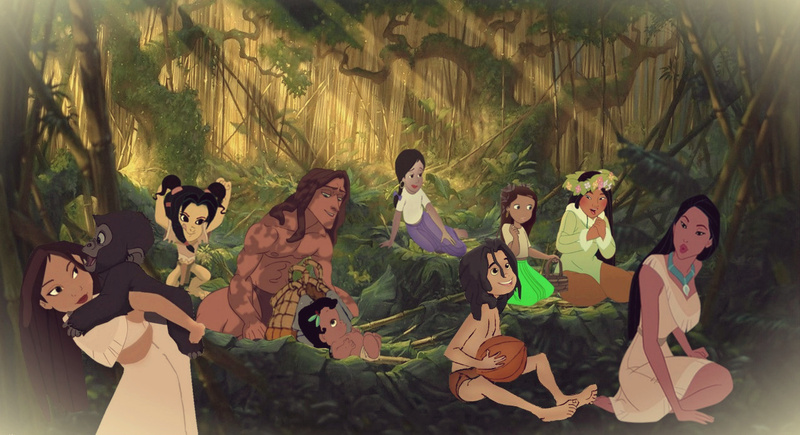 Credit starting on the left: Mine-Nidia, behind Tarzan hHutchy-Kia, auroraxaurella-Kimama, TheCrystalRing-Tamela, Angeelous-Chinete, LightningRed-Iraya, and the boy अगला to Pocahontas is chesire- Mawali. Awesome! Love it! It looks so complete. What a happy little family. oh thanks Angeelous i was wondering. I'll add that to the description. Wow! This is amazing, are they all Tarzan and Poca's? This looks like it took a while!